There are Many Pokemon Hacks, Cheats, Tricks available in the internet for Pokemon game lovers. But most of the Pokemon Hacks for Android is not Working right now. Because the Game developers Nintendo and Niantic have fixed the most of the hacks whenever rolling in the internet. However, This Pokemon Hack for Android Guide still working and You can utilise our Best 10 Pokemon Hacks for Android, Cheats, Tweaks Guide to gain more XP points and Play the Pokemon anywhere in World. Many People are searching the for Pokemon by moving around the area to be the best Pokemon Trainer. But, You can use our Guide to Play Pokemon Go Without Moving or Walking anywhere. Also, If you are the Pokemon GO Lover and want play this inside the game without moving anywhere use this best Pokemon Go hack Trick. By using this Hack for Pokemon, You don’t need to go to Real life locations to catch Pokemon. Since it is a reality based game, You have to be there in the Physical location catch the virtual Pokemon. This Augmented Reality interactive game needs your GPS Sensor and Your camera to track the Physical location. So, if you are in the outside of top Pokemon gaming countries, you will get nothing from this game. You need to be in the top Pokemon go Released countries like Hong Kong, Latin America and Caribbean islands,Malaysia, Palau, Papua New Guinea, Philippines, Singapore, Thailand etc. However, You can use the following Best Pokemon Hacks and Tweaks to use Pokemon Go in non releasing countries too. However, Using our Pokemon Hack, You can play this game from anywhere in the world without moving or walking from house. Just sit in your couch and catch the Pokemon in your House using this best Xposed Module Pokemon Hack. Before going to this guide, You need some requirements to complete this guide. This Guide is only for Rooted Android Device. 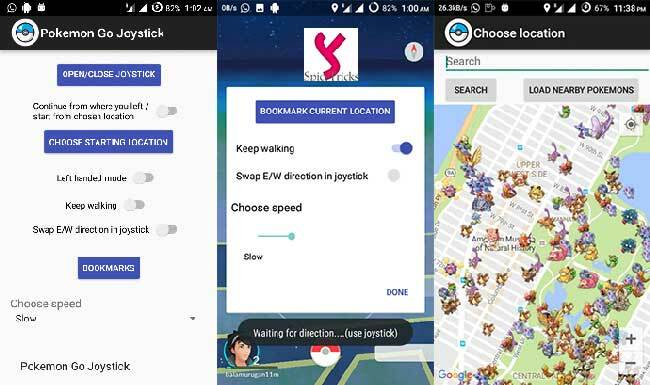 If you don’t have the Rooted Android Phone, use our previous Guide How to Play Pokemon Go without Moving Using JoyStick ( NO ROOT). However, the Rooted phone will give you the Full Features of Pokemon GO Game. What is Pokemon GO Joystick Module and How to get it? Pokemon GO App uses your GPS Sensor to track your location. So that, You can catch Pokemons in real locations in area. But, if you want to Play the Pokemon without Moving out, you need to fake the location of your Android Phone. For that You can use FLY GPS Pokemon Hack To play Pokemon Go Anywhere without hacking. The Pokemon GO Joystick module will give you the same functionality but No can detect that you are spoofing the location in Android Phone for Pokemon. Also, PokeMon Android Joystick gives you much useful features. That’s Joystick will be placed as an overlay in your PokeMon game. You can use that to move to any direction, any place in the world virtually. Also, You can change the speed when you are moving around using Joystick. Use this Pokemon Joystick to track nearby Pokemons. You can also Use Pokemon Go Map Guide to track pokemons. Tap any point on the screen to move to any direction. Also, You can hide the joystick. Continue the game where you left in the same direction. First, Download the PokeMon Go Joystick here and then install it in your Android device. Note: You need Xposed Framework installer your Phone. Then Open Xposed framework app in your phone, then Go to modules section and activate PokeMon GO Joystick Module. After that, You have to restart your android phone to initialize that module. Now, Open Pokemon Go JoyStick Android app. In the app, You can toggle the Joystick to ON and OFF. There, You can also choose the starting location of Pokemon GO. That’s it. Now You can play the Pokemon Go Game from your Android Phone without moving. ‘Bookmark’ is a Handy Feature in Pokemon Joystick. Yes, Just open the app and tap anywhere in the map and name the location and store in a BookMark. 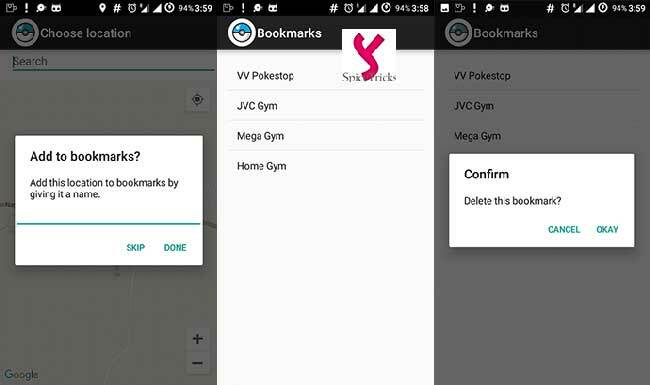 To open a book mark location, choose it from the saved location and go to that place in the Pokemon Game. If you have Failde to detect location issue, fix this by Changing the GPS to High Accuracy, move your location on GPS Spoofer and restart Pokémon GO. When I try to disable AR, everything freezes/crashes. Disable camera by going into REGEDIT on your computer and going to “HKEY_LOCAL_MACHINE\SOFTWARE\BlueStacks\Guests\And roid\Config”. Press camera and change the ‘1’ to a ‘0’, save and you’re done. Pokéstops not working/Pokémon fleeing after 1 Pokéball? If you fake the location using any method, and move fast from one location to another location, the developer can detect the fake locations. Then, Your account could be banned for one or two hours.If you traveled too fast and got soft-banned, it will be removed in few hours. When I start Pokémon Go Mod Apk, I get a gray screen. Either close Bluestacks entirely and relaunch Bluestacks or uninstall Bluestacks and redo the tutorial with Bluestacks for Windows 7/8. When I throw a Pokéball, the game crashes. Delete your Google account from settings and restart Pokémon GO. My player keeps teleporting between locations. To fix this issue follow the instruction. Install an app from the Google Play Store called “DisableService” and allow root (obviously), search for the service “Fused Location” under System tab and disable that service. After the restart your Phone. By doing this trick will disable your real GPS and then no teleporting will be happening. If you want your real GPS back, just enable “Fused Location” again and reboot. If you like this guide share with your friends.